This week’s WordPress photo challenge invites us to imagine which of our images we would like to see gracing the cover of a book or album. As both books and albums are very important to me, how could I resist the challenge? I’ve already had a go at the book cover, so time to tackle the album. I found this much more challenging, because in my mind my favourite records and cds are very closely associated with their cover artwork, in a much more fundamental way than book covers. I find it very difficult, for example, to imagine any of these records without their original sleeves, and I certainly don’t think I could improve on them. So… I decided to come up with a cover for an album that doesn’t really exist, or that only exists virtually. I like to make playlists on my iPod, which I think is a throwback to a time when making compilation tapes for friends was a really big thing. It used to take hours choosing the tracks, working out what order to put them in, assembling all the vinyl records required, doing the actual recording. I liked to find very short tracks, which would fill up the little space at the end of a side. Velocity Girl by Primal Scream at 1 minute 27 seconds was always very good for this purpose. It’s much easier now of course, just a case of dragging and dropping files. 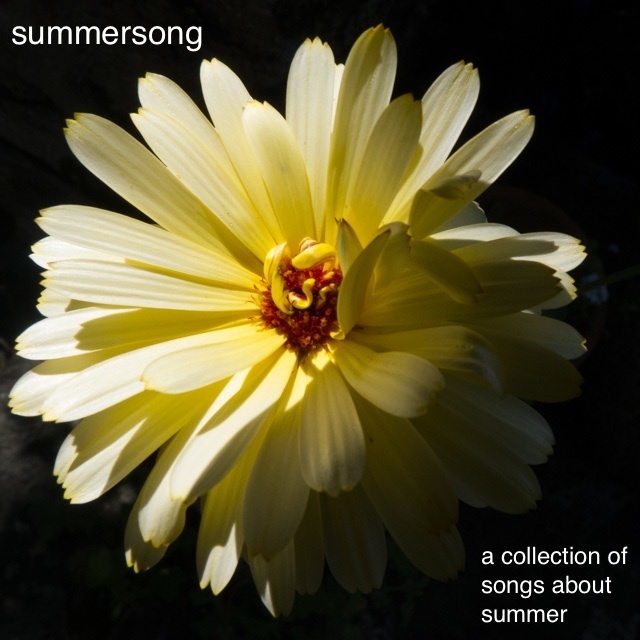 Summersong is a playlist that I’ve been listening to a lot over the summer and autumn. Some of the tracks are specifically about the season, others just have a summery feel to them. The image is a calendula flower, taken this summer. I was really pleased with the way the background is completely blacked out. It suits the playlist, because whilst some of the tracks are light and summery, some are a little darker. This prompt has produced some really great posts from other bloggers. Take a look at this WordPress Weekly Photo Challenge post to see some examples. I’d buy it! It is a stunning image and it works beautifully as your album cover . You are so right – the cover of an album becomes intrinsically entwined with its music and it is hard, if not impossible to mess with it. I remember well the days of making compilation tapes … the most memorable of them was the ‘birthing’ tape my husband made for my labour with our first child …. his sense of humour abounded throughout and I nearly punched him when Betty Boo ‘Where are you Baby’ came on after 12 hours!